Home > Construction Training Manuals > Utilitiesman Volume 01 > Figure 3-45.Presto-Lite Heating Unit. 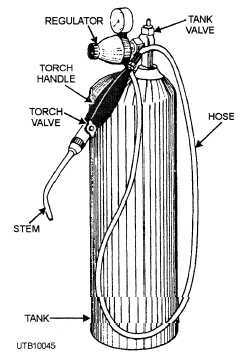 regulator, rubber hose, torch, and two or more removable tips. This unit burns MAPP gas as a fuel in the presence of oxygen. Figure 3-45 gives you an idea of what the Presto-lite unit looks like. When heating, apply heat to the fitting or thickest part until it reaches the melting temperature of the solder. Feed the solder at the edge of the fitting. When a continuous ring of solder appears at the end of the fitting, you have completed the joint. After soldering is complete, clean the joints with a wire brush, soap and water, or emery cloth. Exercise caution to remove all flux from the joint after it is soldered. Any flux left on a joint causes corrosion. In plumbing, you may occasionally be called upon to join copper pipe or tubing by silver brazing. You may also use silver brazing in making repairs to air- conditioning and refrigeration equipment, water systems, galley equipment, and so on. In SILVER BRAZING, also called SILVER SOLDERING or HARD SOLDERING, joint members are fused by heating with a gas flame and silver alloy filler metal with a melting point above 800F, but below the melting point of the base metal. The filler metal is distributed in the joint by capillary attraction. Figure 3-45. - Presto-lite heating unit. capillary attraction is to consider some everyday examples of the process. If you put one end of a strip of cloth in a glass of water and allow the other end to hang over the edge of the glass, the end of the cloth that is not in the water becomes wet. Water rises in the cloth by capillary attraction. The wick on an oil lamp can be lit because the oil rises in the wick by capillary attraction. In both examples, we have a LIQUID (water, oil) that moves into an opening in a SOLID (cloth, wick) by a process called "capillary attraction." The basic rule of capillary attraction is that the distance the liquid is drawn into the opening in the joint depends on the size of the opening in the joint-the smaller the opening, the farther the liquid is drawn in. In just the same way, capillary attraction causes the melted filler metal used in silver brazing to be drawn into the narrow clearance between the joining members. Capillary attraction does not work unless the filler metal is melted and unless the size of the opening is quite small; therefore, the application of heat and the use of a very small clearance between joining members are essential to silver brazing. The heat is necessary to melt the filler metal and to keep it molten; the small clearance is necessary to allow capillary attraction to draw the molten metal into the space between the joint members. Silver-base alloys are commonly used as filler metal for brazing. Although filler metals other than silver-base alloys are often used, the technique for making a brazed joint is basically the same. The main difference is the amount of heat necessary to melt the filler metal. In all instances, this temperature is below the melting point of the base metals. Silver-brazed joints have high strength on ferrous and nonferrous metals. The strength of a joint that is made properly exceeds that of the metals joined. On stainless steel, it is possible to develop a joint tensile strength of approximately 130,000 pounds per square inch (psi). Since brazing with silver-based alloys is typical of brazing in general, it is especially interesting at this point to note the use of these materials as filler metal. This information applies equally to brazing with other filler metals that are distributed by capillary attraction. Two methods are used to make joints between tubes and fittings in piping systems with silver-base brazing filler metal: the INSERT method and the FEED-IN method. With either method, the parts must be adequately supported during heating. The work must be held firmly in position until the brazing filler metal has completely solidified.